An experience like no other. A pedicure that is instant nirvana. After a long, tiring day, all you want to do is to place your feet into lukewarm water and feel a relaxation that is immensely gratifying, don't you? The tingling sensation in your feet is a sign of all the stress, tension, and worry flowing out of your body. Your feet, you may be surprised to know, are where all the internal and external tensions converge. It is, therefore, important to concentrate on this part of the body for immediate stress-relief. We often neglect our feet while we are very busy paying attention to the rest of the body. After a long day of work, it is often good to show it some love, treat it to a relieving massage. A good pedicure helps in restoring the balance of energies within our body and imparts strength to our feet muscles which need a frequent massage to stay fit and healthy. Not only does a pedicure ease muscle pain in the foot and the lower part of your body, it also reduces the risk of joint pains. A good massage is one of the most therapeutic and healing experiences ever. 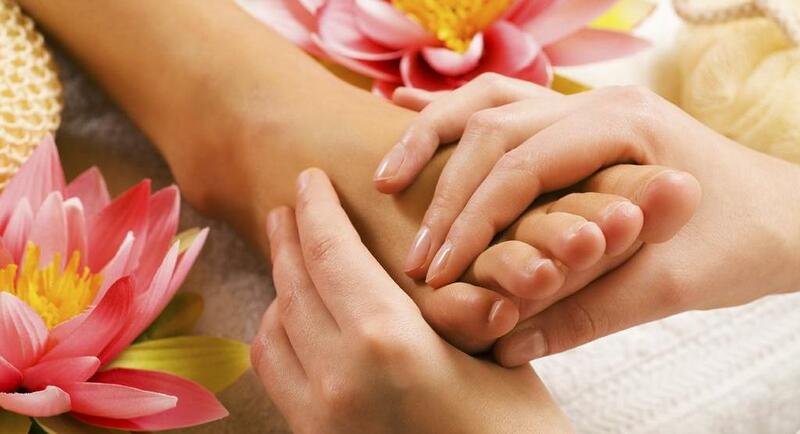 More de-stressing than anything else is a long, pleasurable pedicure which also includes a relaxing foot massage. • In a motion that goes back and forth across the foot, use the heel of your hand to stroke the sole of your foot in a straight line to the base of your toes. • Wiggle the toes, pulling each gently and then focus your attention on the metatarsal bones that run along the top and the middle of the foot. • Slowly massage one area at a time by moving from the base of your toes to just above the ankle. • Using your thumb, press a spot on your sole and make small, circular movements. Repeat until you’ve covered the entire sole of your foot. • While you are working the sole, make crosswise movements, back and forth, from the heel to the ball of your foot using your pointer and middle fingers. Not only helping soothe sore muscles, a massage therapy also improves blood flow and acts as a powerful, natural stress-reliever, while also helping people overcome a number of health conditions that range from fibromyalgia to anxiety and arthritis, among others. A good foot massage also goes on to provide relief from PMS symptoms and swollen feet, helps with anxiety, ensures you get a good night's sleep and has even been known to lower blood pressure! What's more, a lot of studies are underway to prove how effective a massage is in providing relief from serious ailments that range from AIDS to cancer. • Massage therapy works wonders in pain-related conditions that include low-back pain and chronic neck pain, some of the most common ailments of everyday adult life. • Though on a short-term basis, massage therapy brings relief to pain-inflicted cancer patients. It also helps them relax, boosts their mood and makes them feel better. • Massage therapy also helps reduce depression. An exception, however, could be pregnant women who go through depression during the third trimester. • A 2010 research concluded (although the evidence is not definitive) that massage therapy helps provide temporary relief from pain, fatigue, and other symptoms associated with fibromyalgia. • A 2010 research conducted on preterm infants has revealed that massaging them using moderate pressure may help improve their weight gain. However, another 2013 research determined that there is no definitive evidence to prove the same kind of benefit to healthy, normally developing infants. • Apart from improving a person's immunity, massage therapy also helps one give up smoking. Ayurveda, as the ancient, revered, medical science from the mystic lands of India, has always attempted to understand the very origin of a disease and remove the root cause. Massage therapy holds a special place in Ayurveda, all the more so because the therapy helps remove unwanted toxins from the body and nullifies free radicals, thereby reducing oxidative damage. In addition, essential oils used for massages in Ayurveda are known to be extremely nourishing, detoxifying, battle the signs of aging and leave the skin feeling soft, supple and smooth. Massages with these oils also generate positive emotions, making a person feel relaxed and calm not just mentally and physically but spiritually as well. The Kansa wand is a beautiful massage tool from the Ayurvedic healing tradition that will work wonders for giving you a youthful face, stress-relief and total skin and mind-body rejuvenation! This fascinating tool has been used to recharge and harmonize the subtle energies of the body, enhance health and strength, support general well-being, and relieve stress. The domed massage surface is made of Kansa, a very pure form of bronze known throughout India as the healing metal. This sacred metal blend helps in harmonizing the energies in our meridians and chakras. Think of it as tuning up your face, reawakening the beauty in your skin and your innermost being, and helping you feel energized and light. Gliding smoothly along the shape of the feet, a foot massage with this wand helps you slip into a deep state of relaxation. As it moves up and down the foot and in other intricate moves through the fingers and the top of the foot, you can almost feel the negativity, heat, and toxins flow out of your system. It was common in ancient Indian traditions to rub the Kansa metal on the feet of someone who has a high fever. Our experts share that they have themselves observed that eyes become less bloodshot and the high skin tones normalize just by rubbing the feet with the Kansa foot wand. Another variation of the Kansa wand is the Kansa face and body wand which, in plain words, happens to be a miracle wand in the user's hand. Much of the work done with the Kansa Face Wand involves simple repetitive long strokes and circles. On a more subtle level, this tool works with the meridians and chakras, having a balancing and revitalizing effect. The smooth surface quickly warms making it the perfect, comfortable extension of your own healing energy. This is your chance to claim a mindblowing offer on the Kansa Face and Body wand- an offer like never before. Not only do we pitch in a FREE KUMKUMADI OIL with the richness of essential oils and saffron for a glowing, beautiful skin, we are even giving you FREE SHIPPING! This is the BEST OFFER you will get on the Kansa. DO NOT MISS IT! The Kansa massage tool’s healing metal surface shines golden because of its extreme purity and is set upon a hand carved handle that is irresistible to the eye - naturally drawing one to pick it up and use it. This wand is, no doubt, your ticket to complete de-stress and that too at a price that will make you regret all the money spent on those expensive massages at the spa!